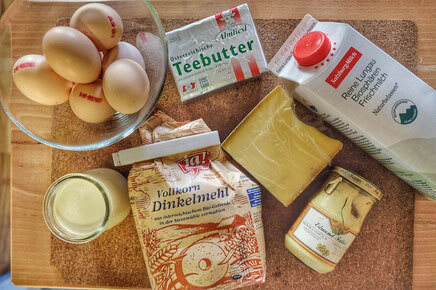 my 1,5-hour saturday chase after the comte cheese all around Vienna was succesful at last so nothing more was standing in my way to start making the cheese soufflé I was keen on making for such loooong time. 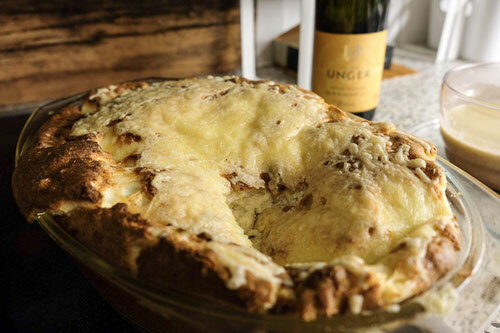 And this time I couldn't used better recipe for this classic french recipe than the one from Raymond Blanc, whose home is Comte region in France. Let's get on! Be sure that if you are preparing your cheese soufflé, you have to be a bit patient and also you have to spend the whole preparation time at the stove, having everything under control. It is very easy recipe to make, but you have to be concentrated. There are 5 steps you will need to go through, to reach the finish line. Evenly spread the softened butter all over your glass dish to prevent the soufflé base before burning. Then add your breadcrumbs to stick to the butter - this will be your foundation for your next preparation of soufflé. In a small saucepan let your butter to melt. Add your 50g of spelt flour and after the mixture became nice and nutty, add 450ml of warm milk, little by little. Whisk the mixture continuously to prevent becoming lumpy. At this stage, add your 160g of comté cheese, and 1 tbsp of dijon mustard. Continue to cook and stir on lower heat for another 2 minutes. Remove the saucepan form the heat and allow the mixture to cool down a bit. After that - add the 3 egg yolks. Put 7 egg whites into a mixing bowl and add the lemon juice. When your eggs are firm, add one third of your egg whites to the soufflé mix. Mix up briefly. Then add the rest of your egg whites into soufflé base very gently and carefully. Make sure you keep your soufflé mixture fluffy, light and voluminous. 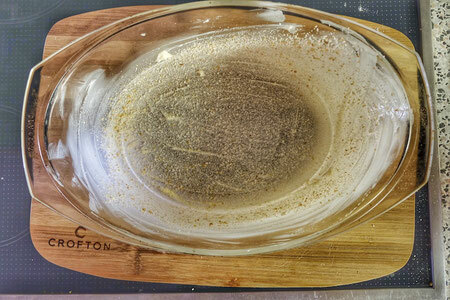 Pour the soufflé mixture into the prepared baking dish and put it into the oven for 20 minutes. To complement your soufflé nicely, you can make this delicious cheese sauce. Just bring to the boil 150ml of double cream, add 70g of comté cheese, stir continuously and season. Let the cheese melt away and pour the sauce into a sauceboat, when finished. After 20 minutes of baking, take out your soufflé and sprinkle over 20g of comté cheese and bake for further 5-10 minutes. You will get beautiful cheese crunchy crust on the top of it. It is the part of a this dish which I love the most. Serve your ready soufflé with the cheese sauce on the side. Complement this delicious dish by drinking a good glass of white wine. I found the Grüner Veltliner by Petra Unger or the Edlmoser Lässiger Grüner Veltliner. Both fruity, dry white wines which I warmly recommend. I recommend of buying your comté cheese ahead as it is not a regular cheese you could buy anywhere in Austria. You can visit e.g. Amazon to buy this amazing comté which I love to buy: Barufe Comté. ENJOY guys! and leave your comments below if you made this wonderful recipe by yourself!